ORGANIC INCA BERRIES 500 grams - AN AMAZING SUPERFRUIT! The Inca berry have more dietary fibre than many other fruits. 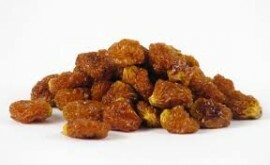 Inca berries have almost double the fibre of dates. Inca berries also have more fibre than prunes, blueberries, raisins & apricots. Prized since ancient times, Inca berries are a delicious super fruit with high levels of phosphorous, vitamin A, vitamin C, vitamin B12 and protein. Inca berries also have high levels of bioflavoniods. These little golden berries are frequently enjoyed by vegans, vegetarians and others looking for a delicious and nutritious treat. Inca Berries are an amazing, tangy taste sensation – sweet with a delicate sour finish. A super fruit indigenous to the high altitude tropical regions of South America, the berry’s amazing array of health benefits put it in class of its own.